The official unofficial CHH Team Bears Thread!!! Babv Rock, I am unable to VM you. Do you know why? Go Bears! 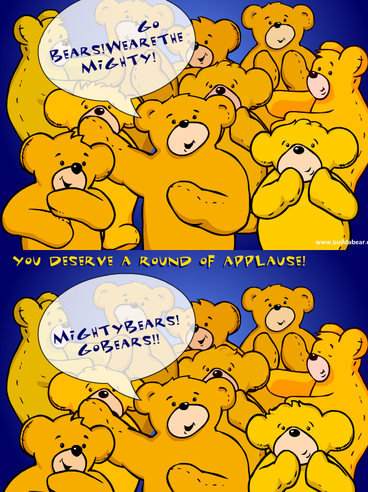 We are the mighty, mighty bears. Go team! cannot vm until after certain number of posts. 10 i think. St2nic, would the phrase: "Go Bears! We are the mighty, mighty bears. Go Bears!" work as a team cheer if my team members like it? Team members, what do you think of that cheer? I also don't know how to make a team graphic. works for a team cheer, if you decide. Last edited by st2nic; 07-09-2018 at 02:09 PM..
Go Bears! We are the mighty, mighty bears. Go Bears! Team members, are you going to participate or will I be the only person to participate? I understand being busy, but can you please try to post if you are busy?